The otters of Green Isle have long been enslaved to the Wildcat Riggu Felis. They work and wait for the day their savior will arrive- the prophesized High Rhulain, who will lead them in battle and a return to glory. Meanwhile, young Tiria Wildlough, an ottermaid at Redwall Abbey, pines for her chance to learn the ways of the warrior, much against the wishes of her father.The otters of Green Isle have long been enslaved to the Wildcat Riggu Felis. They work and wait for the day their savior will arrive- the prophesized High Rhulain, who will lead them in battle and a return to glory. Meanwhile, young Tiria Wildlough, an ottermaid at Redwall Abbey, pines for her chance to learn the ways of the warrior, much against the wishes of her father. So when an injured osprey arrives at the Abbey, seeking help for its wounds and carrying tales of an embattled clan of otters, young Tiria knows what she must do. This book was highly enjoyable. It had a different plot from the other books (always nice) and the Long Patrol, so it was bound to be so. Another grand Redwall adventure with new characters and lands, and some unexpected surprises. Redwall books may often follow a certain story "formula" but they always surprise me in some way, and this one was no exception. Great story! I think this is the best (and my favorite) Redwall book in quite a while! An epic plot, good characters, lots of action--and, of course, many beautiful descriptions of food. As always, this is a Redwall book so naturally I enjoyed it. Once again, I love how Jacques features characters at every stage of life and girls are in leadership or warrior roles as often as the guys are. That being said, this wasn't my favorite book in the series. the characters were a bit bland, usually there are a few that really stand out for me and I didn't really get it for this one. Still a good adventure and a fun read. One of my favourites. Tiria is a fallible character, Riggu and his family are villains that have some depth, and the supporting cast is strong. Tiria, the otter maid, discovers she's of royal birth and must leave Redwall for Green Isle ASAP! With the assistance of one mad and perilous hare, a score of Long Patrol hares, one goose, one hawk, and the spirit of Martin the Warrior; Tiria attempts to free the enslaved otters from the terror of Rigu Fellis. Not as cheerful as a few of the others but certainly full of adventure. Lots of different stories going on where I would have liked to see more development. This one seemed similar to Pearls of Lutra to me, in that it was one of the rare occasions there was an otter protagonist I wasn't interested in. That said, it was still better than Pearls of Lutra, and I enjoyed the story overall. I thought this book showed true companionship and loyalty. A decent installment to the Redwall series. A brilliantly woven story full of action tragedy and excitement. One of my all time favorites. In my opinion this is the best book in the Redwall trilogy. I would definitely recommend this book. Jacques' later books were typically poorer than his earlier ones. However, there are some exceptions. Rakkety Tam, for one, and High Rhulain. Sure, Tiria in this novel was underdeveloped, but the setting and plot (apart from the Redwall setting, which was, eh, pointless) were fantastic. Leatho was also rather epic, and realistic at the same time, which is difficult to do. 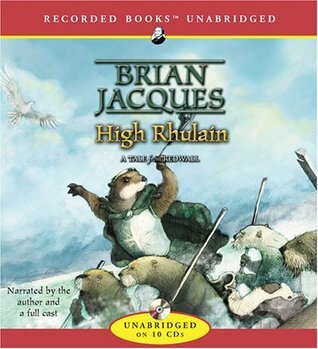 All in all, I'd rate this as one of Jacques' best works in the Redwall series!